Bidier Maaman Trevor Walley and Bidier Maaman Len Collard (Traditional Owners) yarn about their moort. LC: Now, just first of all, Kaia - my heart’s beating a lot to see you. Trevor, just tell us what your name is, when you were born and where you were born. 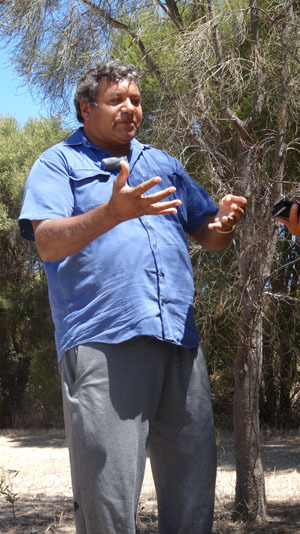 TW:	My name is Trevor Walley, but like a lot of Aboriginal families in those times, families were looking after family, and so my family goes back to the [Garletts Indij] *0:02:10.2, the Winmar-Humphrey line, but like everything, in those early days, it was very hard for Nyungar families, Aboriginal families, to be accepted in the white community because Aboriginal people weren’t recognised as citizens, and so sometimes when we have to give family names, you must understand that where we come from, they were looking after a lot of babies, a lot of kids and Stolen Generations and the like and so, to put the picture clear in people’s minds, a lot of families were taking in Aboriginal families and giving them bed and food and looking after them. Because in them days that was number one priority, is looking after— they’re calling us “the children” and they didn’t care where you’d come from and what name you were, Aboriginal families had just grabbed the babies, grabbed children and brought them up as their own and a lot of Aboriginal families accepted people as their own, even though they might have a different name, they brought them up as their own. And that’s throughout a lot of Aboriginal people. They were one of the most kind people I’ve ever known in the world, because they’ve brought people in and looked after them. LC:	What day was it? TW:	17 September. Do you want the year? LC:	It’s a day to remember. TW:	Well, yes, that’s 17 September 1957, but I always acknowledge that where I was born in is October 1834, when they actually were the European colonisers were asserting their authority on Aboriginal people by the massacre of Pinjarra, and that’s where I was born, right there where they were shooting is where I was born. LC:	So Trevor, talking about the family, tell us who your mum and dad is? TW: Well, Dad is— my step-father is Robert Walley, the Aboriginal name for the family was the Woylie, and my mum is Theresa Winmar, and Wernmaar is the “spirit of the hands”, the “wern” is spirit, “maar” is the hand. So Winmar, spirit of the hands. And then it goes on and on all through Nyungar country. So we’re connected as from Moora, Albany, Jerramungup, Kellerberrin, the whole lot, because we travelled. And you can moort, you can find relations, all through your country. But that’s my country is the south-west Nyungar boodjar. LC:	And what about like Mum and Dad’s family, who were the old people, what was your great-grandparents’ name? LC:	What about Mum’s line first. LC:	What, from New Norcia. TW:	New Norcia Mission. There’s records on his diaries, Salvado kept diaries in Spanish, Latin, but once we interpreted the Spanish/Latin, you could find that a lot of Henry’s sisters were taken from Perth when he travelled to Perth. So we can only trace our line back to Perth. LC:	What do you know about Latin? LC:	Because the surname Walley or Woylie, in the mission records at New Norcia, your old people I think are mentioned as being Christianised and baptised in those records. LC:	And I think what was interesting for me, because despite my memory, that my old people are in the same books, so I guess both on the Swan River side of things as well as the missions up in your country there, the relationship and connection to myself and yourself and our families go back pretty well to the same camp fires, really. TW:	We all go back to the same campfires, Leonard, you’re absolutely correct, and that’s what’s very strong about our culture, that people embrace people, embrace Nyungars, because we all have a similar story, we all have a similar culture and we’re always— a hard struggle, but the strength of the family kept the Nyungar people together and no matter where you go with the Nyungar family, you’ll always find a bed and a camp fire, so wherever you go in Nyungar country, you’ll always find a bed and a camp. So history brings us back together. And yes I must be honest, I think if it wasn’t for the different churches, a lot of us wouldn’t be here, because they provided us a bed and shelter and food when the rest of society was just abusing and using us and killing us. And so churches enabled the children to survive to the present where we can have a look at it and seriously think about how we were treated by society as a whole…. TW:	Granny Kay Blurton and Morrison and Martin Walley. And I grew up in the camp and I used to call them “Mum” I used to call Granny K “Mum” that was my Godmother, Granny Kay Blurton. And Phil Bennell and Auntie Ivy. I grew up in that family and I lived on the river. And by that I used to go spearing fish.